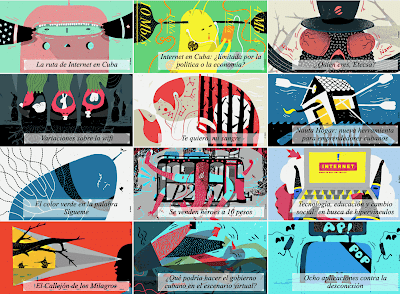 Perhaps the most outstanding feature of this collection is not any one of the articles, but the fact that they were pulled together and edited as an innovative online "dossier" -- an anthology of articles on the Internet in Cuba. Finally, the editor, Elaine Díaz Rodríguez. asked me for feedback on her opening contribution ¿Puede Estados Unidos conectar a Internet a los cubanos? and I might as well share my comments. Elaine covered several US efforts to influence the Cuban Internet, most recently Trump's Cuban Internet Task Force. I've written a couple of posts on the Task Force, which I see as a political act. That being said, the Task Force participant's hearts are in the right place for the most part and we can hope that genuine aid and investment might be possible in the future if Trump is defeated and Diaz-Canel adopts Internet-friendly policies. Elaine also drilled down on the Alan Gross fiasco. I've written many posts about Alan Gross, including several on what he actually did, how little difference he would have made had he succeeded and how much the Cubans overstated the impact it would have had. I agree with Elaine that nothing happened as a result of President Obama's trip to Cuba. That being said, Google has worked diligently, before and after President Obama's trip, to establish relationships in Cuba. The only concrete result has been their caching server (GCC) in Cuba, but the relationships they have built may pay off in the long run. (GCC has resulted in a noticeable increase in YouTube traffic relative to Facebook). I've also written posts on La ruta de Internet en Cuba -- including one on the initial Cuban Internet connection over a link provided by Sprint with a subsidy from the US National Science Foundation and several on pre-Internet networking in Cuba. I've speculated on the question raised in the essay Internet en Cuba: ¿limitada por la política o la economía?. From the early days of the Internet, it has been both the economy and politics, but I would add vested interests and bureaucracy today. Another post asks ¿Quién eres, Etecsa?, a question I've also asked, but can't answer. The post Te quiero, mi sangre shows WiFi hotspots being used to communicate emotion and presence, in the tradition of the pioneering Hole in Space performance art project. I've also looked at Nauta Hogar, and, while I agree that it is useful for some tech and other small businesses, it is a dead end on the road to home connectivity. The articles include photos and other images as well as original illustrations.